We assume that you get the following information from your web hosting company. Select File -> Publish Site -> Publish to Remote Website from the main menu or click on the down arrow of this button on the toolbar. We will create a profile so that the same information can be used to publish your website next time. 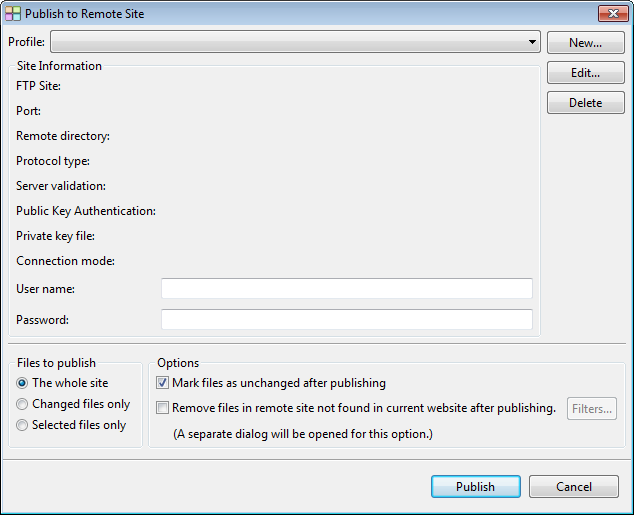 Press the "New" button on the Publish to Remote Site Dialog. Give this FTP site a name, for example "My Website" and enter it into the field "Profile name". Then, enter the information from your web hosting company as below. If your web hosting company gives another port number other than 21, change it to that value. If you like, you can leave the fields "User name" and "Password" blank and enter them each time you need to publish your website. Press the "OK" button to save this profile. The newly created profile will be selected automatically. 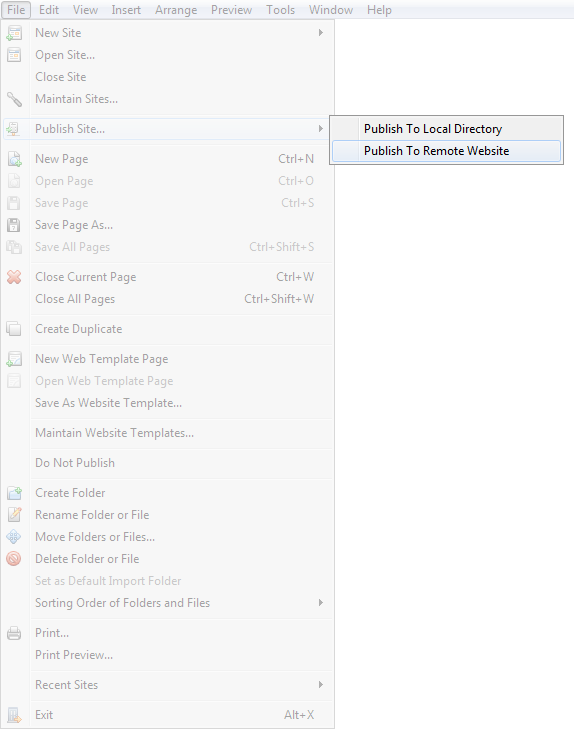 Press the "Publish" button to publish your website. Next time you need to publish to the same website, just select the profile "My Website" from the drop down menu of "Profile". 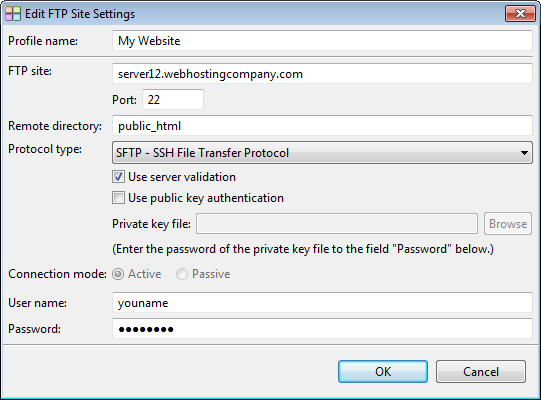 If your web hosting company supports SFTP, use it instead of FTP as it is more secure. Your data, user name and password will all be sent encrypted. 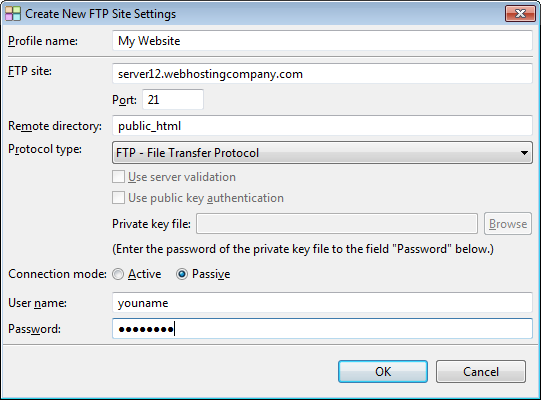 When creating a new FTP site profile, just select SFTP for the protocol type instead of FTP. You may also need to change the port number from 22 to the one that is given by your web hosting company. The settings will look like below. If your hosting company supports public key authentication, you can select the option "Use public key authentication". Then select the corresponding private key file. If the private key file is password protected, you can enter the password to the "Password" field below. Press the "OK" button to save the profile and publish your website just like using FTP.